I’ve been posting markers from the Stones River battlefield for the last couple of weeks. One of the war’s largest and most important engagements, only a portion of the field is within the National Park boundaries. Even sitting adjacent to a major interstate, it seems only a minority of battlefield stompers visit the site. In my own case, over the years I found that travels took me past the battlefield more often than those agendas allowed me to stop! All told I can tally maybe a half dozen visits in all those years of driving through central Tennessee. That is a shame. Even the small portion of this field that is preserved is worth more than a quick drive through. 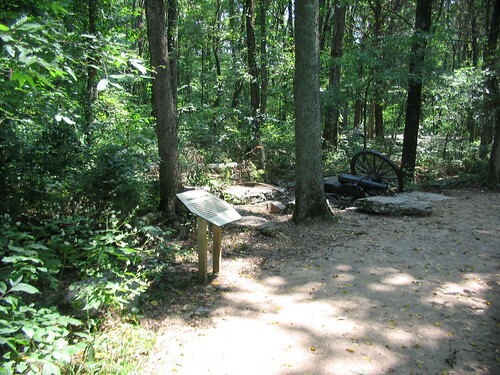 The 570 acre park includes several of the critical points of the battle. With plans to clear some non-historic treelines and restore the cedar breaks, the battlefield itself has evolved in recent decades to offer the visitor a better feel for the terrain. A riverside trail system, the Greenway, maintained by the city of Murfreesboro now provides day hikers and bikers access to the “off the beaten path” sections of the battlefield. 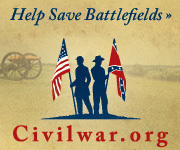 All good news for a field which is often “exhibit A” in the argument for battlefield preservation. One stop within the park that stands out in my memory over the years is the “Abandoned Artillery” display at the Slaughter Pen. For those not familiar with the action, on the first day of battle, portions of Sheridan’s Division were pinned there while fighting a delaying action against the Confederate flank attack. Caught up in the fighting, Battery G, 1st Ohio Light Artillery under Lieutenant Alexander Marshall performed a valiant “retire by prolonge” in an attempt to halt the Confederate advance. 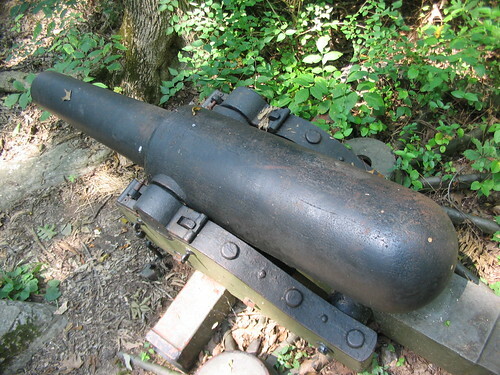 Marshall’s battery went into action with two 6-pdr (2.6-inch) Wiard rifles, two 12-pdr (3.67-inch) Wiard rifles, and two 12-pdr field howitzers. The artillerists fired canister at close range in their efforts to cover the withdrawal. 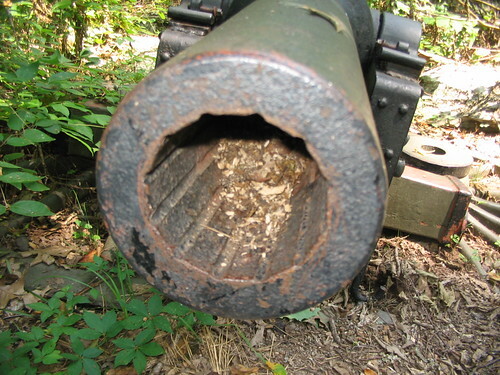 Eventually the battery lost four of the six guns. Marshall indicated several of his carriages were badly damaged by Confederate fire, and the loss of crew and horses prevented their removal. 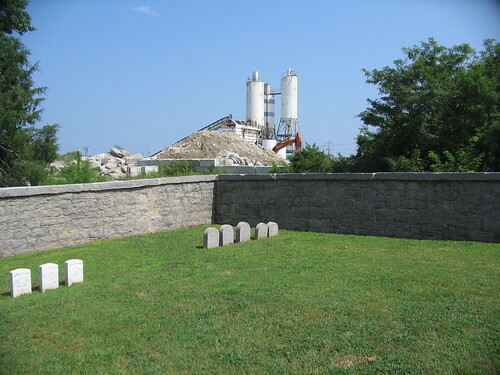 With that historical reference in mind, two Wiard guns sit today on “damaged” carriages within the rock outcroppings of the Slaughter Pen. 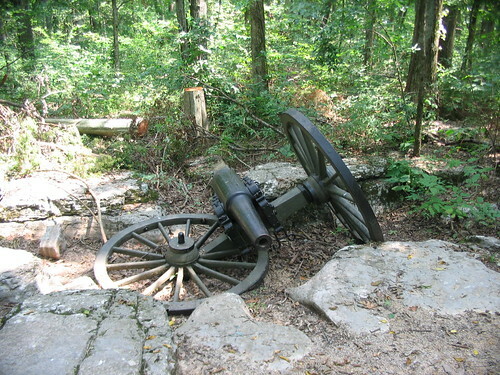 The display stands apart from the typical “guns on field carriages” seen elsewhere in the park, or at other parks, to designate battery positions. The sight of these guns laying on the ground left a strong impression upon me as a child, as I recall. Aside from the unique mountings, the pieces are somewhat rare Wiard rifles. The 12-pdr with odd “U-groove” rifling. We often read about guns lost on the field, with damaged carriages, lost horses, crew members dead. To my recollection, the only National Park Service field display of this type is at Stones River’s slaughter pen.